These are literally often beans, but not always. They are large seeds washed up from more exotic foreign countries. They get washed into the sea (perhaps the plants they came from overhung a stream or river) and then are buoyant enough to float on the water. 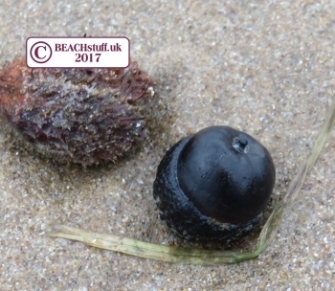 They regularly arrive on our shores looking as fresh as they would have done when they left the pod ( which may have looked something like the one on the right). It's easy to see how this large bean got its name. 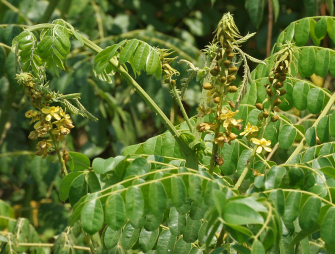 It is actually from a plant that is like a giant pea which grows in Central America, the Caribbean, northern South America and Africa. It has had some journey to get to UK shores. 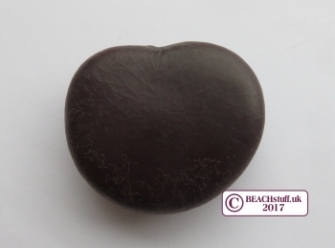 the pods grow longer than 2 metres with each mahogany brown 'pea' or sea heart being around 5cm across. 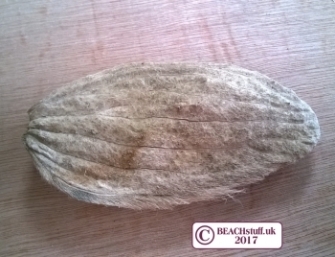 This flat, furry, seed is what you would find in any mango. How far this one has travelled is moot - the local Tesco or Barbados? 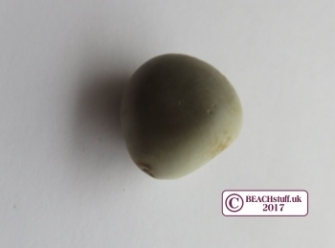 These small, hard beans are greyish and are often used to make jewellery in the Caribbean. They are the fruit of the Bonduc Tree. This, and the bean below are from a flowering plant related to the pea family. Their seeds are deliberately buoyant so that they will be dispersed by rivers. A close relative of the Sea Purse above - another flowering plant in the pea family. It looks remarkably fresh despite its long journey in sea water. This is more of a drift seed than a sea bean. 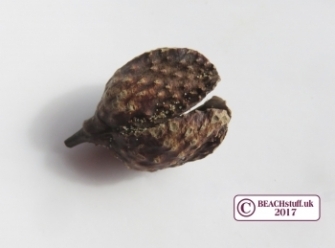 It is the nut of a type of mangrove plant called a looking-glass tree (Heritiera littoralis). 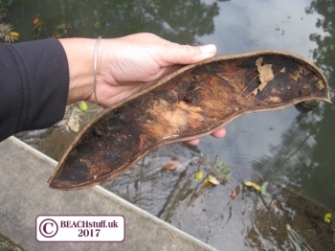 it is a tropical plant, generally found on the coast in Africa and souh-east Asia which means it had quite a journey before it washed up on a beach in North Devon. Of course, not every seed that washed up on our shores is exotic. 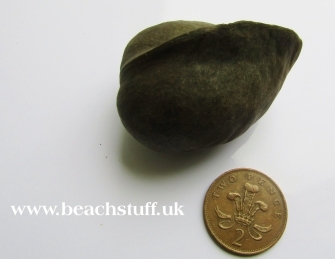 We have some far more familiar seeds on our strandline from local sources. 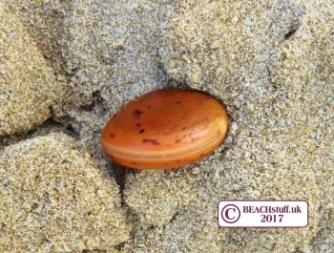 Being woody and often having significant air pockets, conkers, acorns and the like float well and may bob about for some time before being beached. The fruits are probably dropped or blown into our streams and from there travel into the sea. 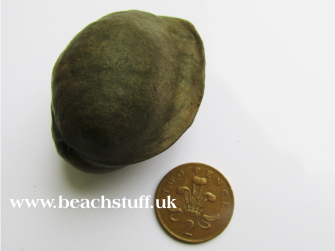 More formally known as horse chestnut fruit, these large seeds frequently end up on our strandlines in autumn and winter. They are distinguishable from the more exotic sea purses as they can be compressed - the seed inside having shrunk. If they have spent a lot of time in water, they can turn completely black. 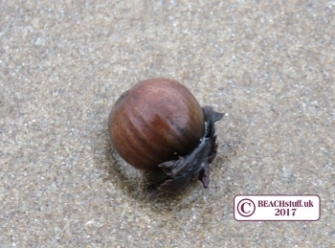 I almost never find a hazelnut away from the beach but sometimes find them in large numbers on the strandline. Sadly, I'd never risk eating them given the amount of time they could have spent in salty water. Finding the outer seed casing is more common than finding the seeds themselves. 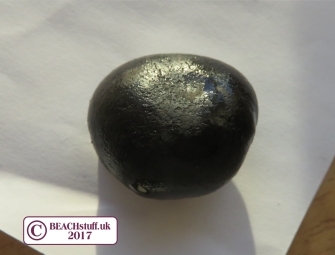 This acorn has turned completely black from the time it has spent in the sea water. 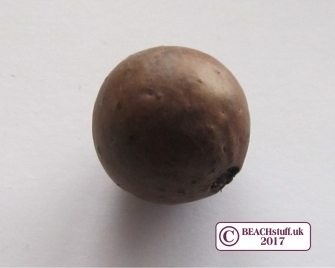 As acorns are not generally salt water tolerant, it is unlikely that these or any other of our home grown seeds would germinate, even if they found themselves on fertile soils once more. Completely spherical, this is about the size of a large grape. What plant did it come from? How far has it travelled? 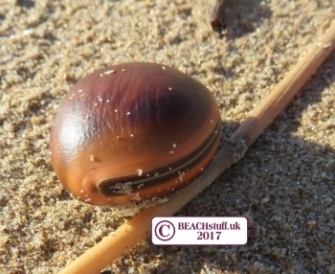 Email hello@beachstuff.uk and we'll feature your ideas and any relevant photos you send. You can send your own challenges into the same email.